SCENIC OVERLOOK: After Kyle Warren Park was built over Woodall Rodgers Freeway, properties that lined it went from having the worst view to having the best view. The green space above the highway has driven up values in Uptown and downtown. I remember the first time I heard about the idea to build a deck park over Woodall Rodgers Freeway. “These Texans are crazy,” I thought to myself. It was 2002, and I had been in the area for just a couple of years, reporting on commercial real estate. I had moved here from Missouri, the “Show-Me” State, where people seemed to put the question of “why?” on everything. I quickly learned that Texas was more of a “why not?” state. And the concept of building a park out of thin air was a quintessential example of that big-thinking spirit. I wasn’t alone in my initial scoffing. But a determined cadre led by John Zogg of Crescent Real Estate was persistent in pushing the idea forward. In 2004, the movement gained traction when The Real Estate Council gambled $1 million in seed money to explore the deck park concept. A year later, Jody and Sheila Grant added $1 million to the pot, and Texas Capital Bank (at the time led by Jody Grant) threw in another $1 million. Supporters went on to raise $110 million—during the Great Recession, no less—including $20 million in bonds from the city of Dallas, $20 million in highway funds from the state, $16.7 million in federal stimulus funds, and, of course the $10 million donated by oil magnate Kelcy Warren to secure naming rights for his son, Klyde. The park, an engineering and construction feat, opened in the fall of 2012. And in that moment, commercial properties overlooking what used to be the concrete hole of Woodall Rodgers Freeway went from having the worst view to having the best view. The societal impact was quickly felt, too. Suburbanites left their enclaves to make a pilgrimage to the urban park. Conventioneers headed north from the Omni Dallas to check it out. And workers in downtown and Uptown left their office towers to line up outside the park’s food trucks. 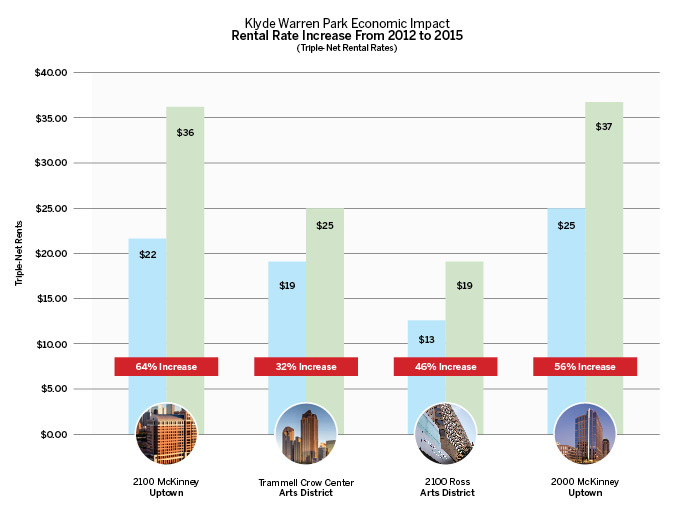 The biggest surprise, though, has been the velocity and magnitude of the park’s impact on commercial real estate. Since late 2012, triple-net lease rates at Trammell Crow Center in the Arts District have climbed from $19 per square foot to $25 per square foot—a 32 percent jump. Rents at 2100 Ross have gone from $13 to $19—a 46 percent increase. On the north side of the park, lease rates at 2000 McKinney have climbed 56 percent, from $25 to $37 per square foot. And rents at 2100 McKinney have appreciated an incredible 64 percent, from $22 to $36 per square foot. Dallas developers, an always-enthusiastic bunch, have snapped up every square inch of land within close proximity. KDC and Invesco are building a 12-story project at McKinney Avenue and Harwood Street. Crescent is developing a 530,000-square-foot tower at McKinney and Olive Street. And Lincoln Property Co. just bought a tract from the Meyerson Symphony Center for a 23-story project called 1900 Pearl. The biggie, though, is Park District, a 916,000-square-foot mixed-use complex Trammell Crow and MetLife are developing on 3 acres between Pearl and Olive streets. The project includes a 19-story office tower and a 32-story residential tower, along with a plaza designed by The Office of James Burnett, the landscape architecture firm that designed Klyde Warren Park. According to new data from JLL, developers in Uptown and the Arts District are asking for—and getting—rents as high as $52 per square foot, an astounding number for the Dallas market. Even with all of the new construction, rent growth continues to defy expectations. For the Dallas metro, it came in at 6.4 percent as of June 2015, according to Axiometrics Inc. Ocupancy stands at 95.5 percent.